Frasier hosts The Dr. Frasier Crane Show, a call-in psychiatry show on talk radio station KACL. His producer Roz Doyle (Gilpin) is very different from Frasier in many ways. She is working class, direct and, at least early in the series, has superficial relationships with many men. 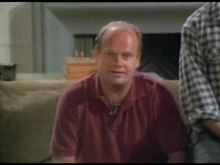 However, Roz and Frasier share a professional respect and a wry sense of humour, and over time, they become best friends. Frasier and the others often visit the local coffee shop, Café Nervosa. Kelsey Grammer as Frasier Crane, a radio psychiatrist. He is a pedantic, finicky, overscrupulous and sometimes pontifical man. Growing up with a cultured mother and "Average Joe" father, Frasier epitomises a synthesis of upper-class sophistication yet is still capable of working-class enjoyments. After returning to Seattle, he begins embracing his more cultured background but developed a more snobbish and haughty self, possibly due to rekindling his relationship with his brother Niles Crane. Despite his pretentious demeanour, Frasier has a good heart and strong moral compass. David Hyde Pierce as Niles Crane, Frasier's younger brother, a psychiatrist in private practice. Fastidious, fussy, and far snobbier than Frasier, Niles' pedantic, neurotic qualities provide a foil for Frasier's own idiosyncracies. He is also loyal, chivalrous and incredibly loving which more than makes it up in the eyes of his loved ones. Niles is very close to his older brother, though their fiercely competitive natures provide much of the humour. Like Frasier, Niles also prefers fine arts, music, and intellectual pursuits to activities like sports, though (surprisingly given Niles' clumsiness and lack of hand-eye coordination) he excels in squash and croquet. Niles is especially mysophobic, given to wiping his hands after human contact and wiping down chairs in public places before sitting on them. John Mahoney as Martin Crane, Frasier and Niles's father, a down-to-earth and unpretentious Seattle police detective who was forced to retire from the force due to a gunshot wound to his hip. Due to this injury inhibiting him from living alone, Martin is forced to accept Frasier's invitation to live with him upon Frasier's return to Seattle. Though his sons share very little in common with him in terms of hobbies and personalities, their relationship deepens over the seasons. Martin's relationship with his Jack Russell terrier, Eddie; beer-drinking (specifically Ballantine) and pea-green recliner are a perpetual source of irritation for Frasier. Jane Leeves as Daphne Moon, a Mancunian physiotherapist and live-in housekeeper hired by Frasier to help Martin with his physiotherapy. Daphne's eccentric, working class background and self-professed psychic abilities (which often end up being correct) frequently lead to Daphne's comical non-sequiturs about her unusual family, to the Cranes' incredulity. Despite her background, Niles falls for her instantly. Niles' obsession with Daphne and Daphne's obliviousness of this obsession is developed throughout the earlier seasons of the series. Peri Gilpin as Roz Doyle, the producer of Frasier's radio show. Originating from Bloomer, Wisconsin, Roz is an attractive single woman with a euphonious voice much-remarked amongst Frasier's listeners. She has no shame about her promiscuity, which is the subject of many jokes and snide remarks, particularly from Frasier's brother Niles. Dan Butler as Bob "Bulldog" Briscoe (seasons 4–6; recurring season 1; special appearance seasons 2–3; special guest seasons 7 & 9–11), the horny, chauvinistic host of "Bob "Bulldog" Briscoe and the Gonzo Sports Show", which followed Frasier's time slot at KACL. Bulldog's practical jokes on Frasier and interruption of his show to boot him out of the booth were a perpetual source of antagonism for both Frasier and Roz. With the exception of Rebecca Howe (Kirstie Alley), all the surviving main regular cast members of Cheers made appearances on Frasier. Lilith Sternin (Bebe Neuwirth) was the only one to become a recurring character.